Jaimee Taylor-Nielsen is a voice actor and radio presenter. Having been represented by RMK since childhood, she has brought her friendly, charismatic voice to hundreds of creative and commercial clients over nearly twenty years. 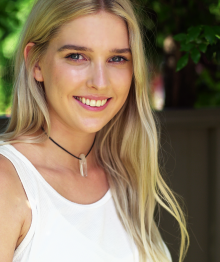 As well as working for many big name brands from telecommunication companies and soft drinks, to beauty brands and major record label releases, Jaimee is an experienced promo voice, currently residing as the female VO for Channel V, ABCMe, ABC Kids and ABC Comedy. Jaimee brings a bright, warm, friendly tone to all her work – be it high energy retail or a natural, sincere read. Her background in acting and many years in the industry help her to take direction well, and interpret what a client needs effectively.